Baltimore’s Department of Transportation (DOT) began work Wednesday, August 8th that will continue through August 15th on the Eddie’s Block of Roland Avenue, between Colorado Avenue and Deepdene Road. Attached is the Roadway Plan Sheet obtained this week by RPCL President, Bob Connors who continues to be involved and will provide updates posted here as developments continue. Please contact your Plat Rep. with questions or concerns. I’m very pleased to announce DOT Director Michelle Pourciau has decided to delay a decision about Roland Avenue modifications until DOT can conduct further studies. It’s good news that DOT decided not to pursue its preferred Option #1 or proceed with lane reductions without a careful impact analysis. Director Pourciau listened to the many comments from the community that were made at the June 14th public meeting and subsequently submitted by e-mail during the input period. She was also very impressed by the results of our recent RPCL poll and the compelling presentation of data as shown at the July 11th Civic League meeting. Going forward, Director Pourciau will form a study group comprised of herself, Jon Laria, the Chairman of the Mayor’s Bicycle Advisory Commission, myself, and a consultant to be hired with expertise in road design. Director Pourciau will work with this group to develop a revised proposal and involve the community in the process. In the meantime, before the end of summer, DOT will restore curbside parking in the 5100 block of Roland Avenue in front of Eddie’s (and looks to do the same in front of the library ), in front of St. David’s Church, and on the southbound side of the 4500 block near The Woman’s Club. We appreciate Director Pourciau’s willingness to listen and to work with us to resolve the question of the future configuration of Roland Avenue, and commend her for this decision. We also benefitted from the efforts of Councilwoman Sharon Middleton and Council President Jack Young, who advocated on the community’s behalf. Most importantly, I want to thank you, the residents of Roland Park, for being engaged in this issue. Whether through your attendance and thoughtful questions at our various meetings, or your participation in the recent survey, your comments and concerns have made a difference! I will continue to update you all as new developments emerge. 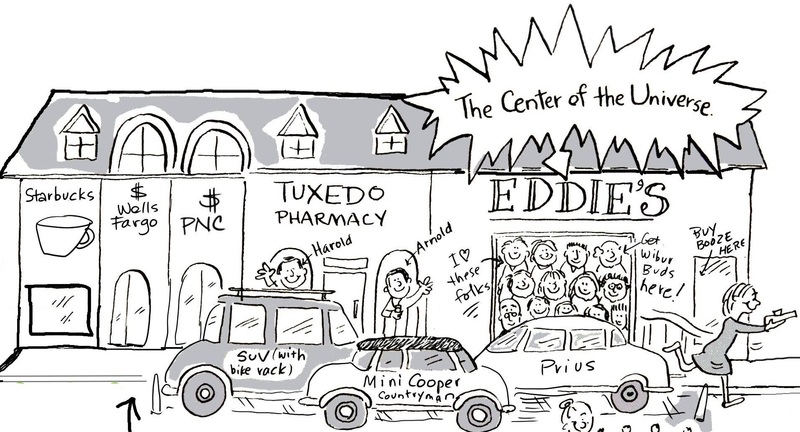 The Roland Park Poster of 1991, also known as The Roland Park Centennial Poster was a big hit back in “the day.” The Roland Park Community Foundation has reprinted this piece by local artist, humorist and author Barbara Dale. Barbara Dale offered to update the original art to give the current Roland Parkers something they could identify with. (Honestly, when was the last time you heard someone waxing poetic over a Morgan Millard’s egg salad on cheese toast?) The posters are for sale at Eddie’s of Roland Park, The Carriage House of Schneider’s (Hardware), and Tuxedo Pharmacy . The 2018 poster will sell for $20 and the 1991, is a limited release will be hand-numbered and autographed by Barbara Dale will sell for $30. The posters will be framed and donated to the Roland Park Library for a permanent display. The Roland Park Community Foundation will also donate a framed copy of the new poster to each of the five schools of Roland Park. (Bryn Mawr, Gilman, Friends, RPCS, and RPEMS). RPCF have arranged a deal that allows for the Fleckenstein Gallery and Archival Framing, 3316 Keswick Rd. (410) 366.3669 in Hampden to frame your poster at discounted rates. Pricing begins at $25. – Saturday, July 28, 2018, from Noon to 2:00 PM. For more information please contact Jim Considine at jimconsidine@gmail.com or call (410) 220-8802.
https://rolandpark.org/wp-content/uploads/2015/10/RolandPark_logo_trans.png 0 0 Keith Couch https://rolandpark.org/wp-content/uploads/2015/10/RolandPark_logo_trans.png Keith Couch2018-07-14 18:47:032018-07-14 18:47:03Roland Park Posters for sale! 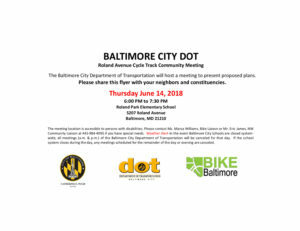 The Baltimore City Department of Transportation (BCDoT) presented five options for correction of the current roadway design on Roland Avenue at their Thursday, June 14th Open House. Note-their deadline for individual public comment is now July 12th, extended from June 28th. A decision is expected by July 19th. To begin implementing our project approval process, the Civic League will host a community meeting, Wednesday, June 20th at 7PM in the North Baltimore Mennonite Church, 4615 Roland Avenue (at Oakdale). Please share this news with neighbors; contact your Plat Rep. to discuss your concerns or questions (if needed, consult map for Plat boundaries). As promised in my communication from earlier today, after speaking with Director Pourciau, I have some updates and clarifications on the meeting format tomorrow evening on Roland Avenue Safety at RPEMS from 6-7:30PM. After signing in, you will be provided with meeting instructions. It will be an open house format with six stations to circulate through. Two stations will have all the information on the proposed modifications including one option that DoT believes strikes a balance between costs and meeting safety concerns, three stations with detailed scenarios to supply data on the pros and cons of the different proposals, and one station providing definitions of bicycle infrastructure. They plan to have 2 to 3 DoT personnel at each station to answer your questions. The Director also plans to circulate with some of her other staff fielding questions and providing answers. At 6:45PM there will be time for remarks on the proposed options. The meeting will conclude promptly at 7:30PM. Since this is a public meeting, the DoT does give the standard option of sending in mail, email, and comment cards as feedback. Please also keep in mind that the Roland Park Civic League has a robust and open and transparent Policy Approval policy where we will plan to meet over the next few weeks and ultimately vote on how we would like the DoT to proceed, and communicate that directly to the Director and Councilwoman Middleton. I am confident that if we tune out the external rhetoric and have an evidenced-based, data-driven discourse we can find consensus as a community and gain the support of Councilwoman Middleton in delivering our message to the DoT. We are not actually that far off from gaining consensus; a safer Roland Avenue for all users has always been our primary objective. And it remains so. 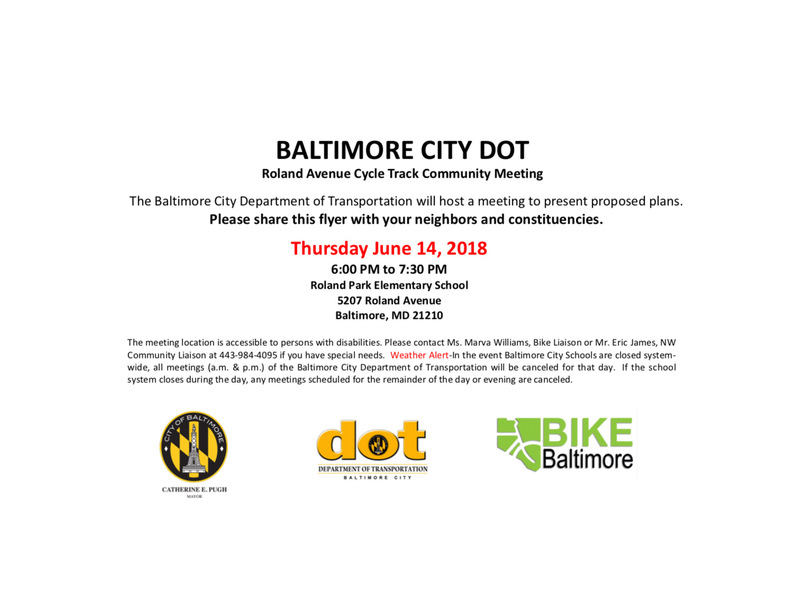 Thursday evening June 14th there is an important meeting for our community with DOT regarding the safety and design of Roland Avenue. I encourage all concerned residents to attend, listen intently, and ask questions. DOT has provided a brief format and agenda which includes a time for open discussion while circulating through stations to see the options up close and review the pros and cons with a DOT official. This agenda format was only provided to us late Wednesday afternoon, and we have several questions about it that we plan to address with the Director of the DOT today, and will forward updates as soon as we get them. In preparation for this meeting, I would encourage everyone to go to our website and review the extensive work done by the Civic League and its numerous volunteer residents who have spent the last 2 years compiling and reviewing data and national best practices. This has obviously been an emotional time for our community, but a solution cannot come from opinion alone. So, it’s time to harness that passion and energy into asking the difficult questions that will certainly come up tomorrow night. I think the best way to ask those questions is to be prepared with data that supports that energy and passion so we can maintain a civil discourse. Shouting down speakers and interrupting presentations does not allow for residents to hear the information being presented and ask their questions. It also runs the very real risk that this public meeting will be shut down abruptly before we have had a chance to hear the information we need to move forward. Tomorrow night’s meeting will not be the end of this discussion. I have been assured by Director Pourciau and Councilwoman Middleton that The Roland Park Civic League and its entire membership will be given an opportunity to consider the proposals by using our new Project Approval process after tomorrow night’s meeting. Roland Park has always met its challenges together. In any consensus building, it is understood that not everyone gets everything they want. But we can be assured that if we work together as neighbors we can find a solution that we can be proud of. We have done it numerous times before, because we take our role as stewards of this beautifully designed neighborhood very seriously. Let’s meet this latest challenge as we have in the past, with civility and common purpose, and create a safer Roland Avenue for generations to come.